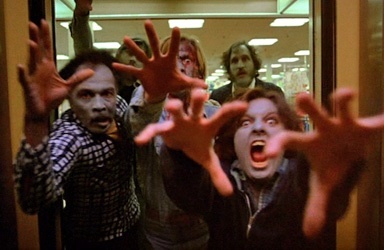 Dawn of the Dead is without a shadow of a doubt one of the best zombie movies ever created & for many the best of Romero’s ‘Dead’ series. 10 years after George A. Romero had shocked audiences with Night of the Living Dead he returned with a much more violent & colourful sequel. 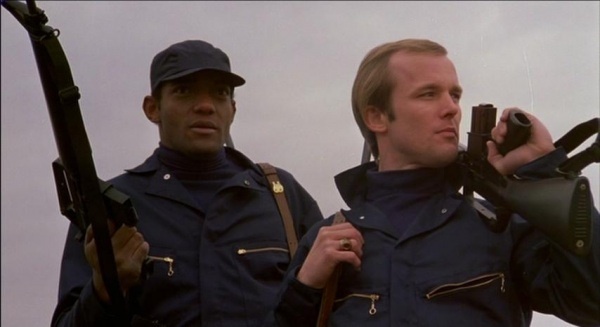 Dawn of the Dead picks up some time after the events of the original movie & sees the United States devastated by the reanimation of the dead. Attempts to control & nullify the threat have failed & society is beginning to crumble. At a Philadelphia news station chaos takes over as the couple, Stephen & Francine plan to steal one the news helicopters. Meanwhile a SWAT team led by Roger is infiltrating an large apartment block that has been harbouring the dead rather then handing them over to the government. As the raid goes wrong thanks to the zombies, Roger meets Peter & the 2 hit it off instantly. Peter is Stephens’s friend & plans to meet up with them once they have the stolen helicopter. He talks Roger into coming along & the 4 eventually wind up at a huge shopping complex. Realising that they can fortify the mall to keep the dead out, they set about making it their home. During the fortification Peter is bitten because of reckless behaviour & turns into a zombie slowly over the course of the film. The group manage to fortify the shopping complex & enjoy a lifestyle bordering on hedonistic. Internal conflicts between Francine & Stephen once she gets pregnant heighten & the groups situation begins to resemble being trapped by the dead outside. Things take a turn for the worse when a roaming band of raiders see what the group have done with the complex & decide to get in on the action….suddenly the threat is greater then just the walking dead. 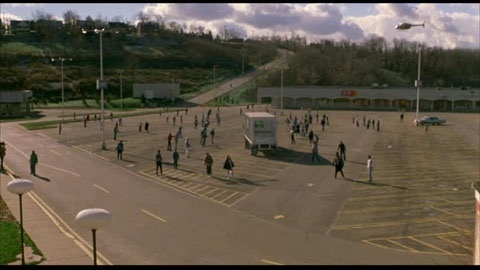 Dawn of the Dead is well-known for taking a tongue-in-cheek view of Americas obsession with consumerism but it is often over-looked at just how scary a horror movie it is. 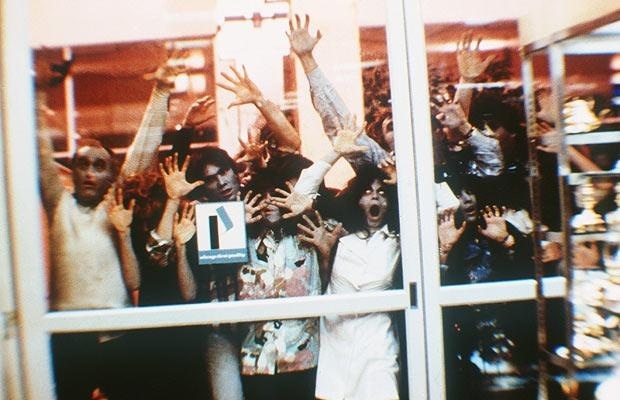 Living every day in a huge shopping complex with the freedom to do whatever we want sounds great based on the thought that you could leave but if there were hordes of zombies clawing at the doors every day preventing you from getting how much fun would it really be? Some of Dawns best moments actually occur before the group end up in the shopping mall. During the news station section we see rational men & women trying to make sense of the irrational. It’s fascinating to watch as they argue & debate over something that just couldn’t happen but currently is. Although we only get to see a small section of the US’s collapse it is easy to imagine what would be occurring all over the country. The SWAT raid on the apartment block is terrifying & gripping to watch. You want to berate the residents for not recognising what is wrong with their loved ones but it’s easy to sympathise with what they are going through. Each new apartment yields some new form of terror & to see the team of professional SWAT members begin to lose it is excellent. In contrast Rogers cool head throughout makes him standout as a character & him & Peter are instantly likeable. The same can’t be said for Stephen & Francine, he is a bullish, angry man who feels inferior to the 2 SWAT team members. She is quiet but strong (a clear reversal of the Barbara character from Night) & comes more & more into her own as the movie goes on. 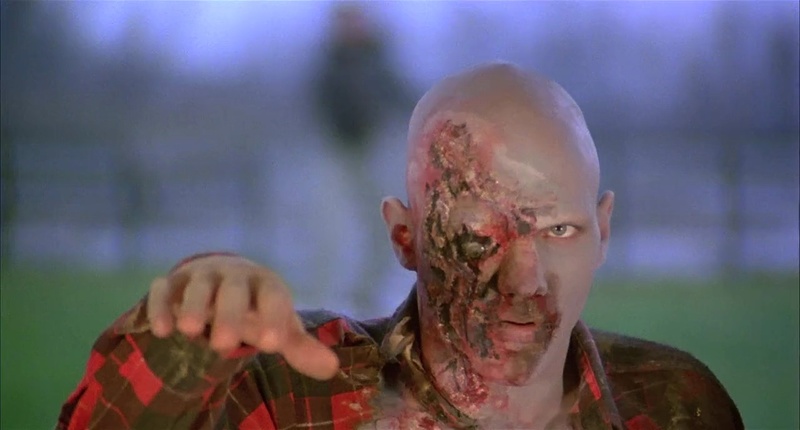 Romero has a knack for finding top actors to play his roles & everyone involved does a top job particularly Peter who goes through a slow & painful (for him & us) zombie transformation. To see him go from a vibrant & somewhat unstable man to a slow-witted shell having to be pushed around in a cart is heart-breaking. Dawn’s zombies appearing in colour had to look & behave in a different way in comparison to Night’s zombies. They still have some elements of humanity in their features but less so then before & some have visible damage to their bodies now. They look great…up to a point. Unfortunately a few noticeable zombies make-up appears quite blue in certain shots while others don’t have any make-up at all (looking quite alive). The other issue I have is with the choice of blood, it’s just far too red. That might seem like I’m picking holes but with such a great movie overall these small faults are far more noticeable. Still it doesn’t detract from the experience really & it’s used sparingly. When Dawn does pile on the gore it does it well, there are some really inventive deaths involving the living & dead. It’s all the more impressive as the darker moments often come when you least expect. 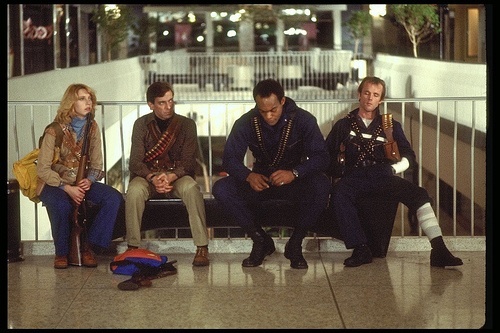 The contrast between the light-hearted tone as the group enjoy the freedom of the mall against the dead banging at the walls makes for a often shocking watch as the tone constantly shifts. Surprisingly the movie ends in an almost upbeat way (although the original plan wasn’t as such) that satisfies enough even if there isn’t a clear cut ending.